I have shopped in several Barrstts stores and found without exception that the staff are helpful and willing to help men tryon and buy heels. Anyone else had good experiences? I asked to try on a pair of womens size 8 black Kicker boots, reason being, I had looked for the exact same thing in the men's section with no luck. --- NB. these boots are totally flat soled! The female assistant (young, indian/asian looking) looked at me as if I had just escaped from a nuthouse and stood there in a confused daze as I tried them on. If I had tried on some stilettos she would have probably run off screaming! I found a similar difference in attitudes from ALDO. In both Bluewater and Oxford Street, entirely different attitude. Couldn't even get the attention of an assistant in Bluewater, I guessed because I was standing next to the girls shoes. Things seem a bit mixed at Schuh too. The local Barratts to me is run by a woman who's been there over 2 years. She kinda 'knows' me, or at least recognises me when I visit. Any size 8's were obviously for me, though I never tried them on in the shop as it's too close to my home town. But buying and returning them were never any bother, and I'd say no-one involved had any doubt who they were for. I guess my biggest worry might have been the Manager asking me to try them on in the shop, so she could avoid some paperwork if I wasn't going to keep them. Bit of aside .... But I seldom even look in Barratts these days. The ankle boots I purchased and returned were not of the quality expected for the price. Many stores including M+S and NEXT, sell better products [fit/quality] for either the same or less money. If you can wait for the styles you like to move into Sale territory, ALDO and ASOS do better styles and better quality for less money. Thinking about it, Tesco currently have a boot style in their sale for >> £7 in store *right click then select Open in New Window* << and a newer version of the boot [similar but not same] for >> £22 *right click then select Open in New Window* <<, either of which match anything I might be tempted by at Barratts. * Tesco doesn't seem to allow direct parsed links. Tesco currently have a boot style in their sale for >> £7 in store *right click then select Open in New Window* << and a newer version of the boot [similar but not same] for >> £22 *right click then select Open in New Window* <<, either of which match anything I might be tempted by at Barratts. The £7 boots mentioned, [originally £18, then seen on sale in one store for £7] have been reduced to £5. Tesco is currently giving 20% off clothing so these boots are available for £4. Bargain. I bought a pair. A bit wider in the toe department than I prefer, but hey-ho ..... £4! Not leather or PU, so won't last long but .... At £4 they're cheaper than a pair of heel tips fitted! I visited [with mens shoes on] Barratts in Watford tonight. Two young assistants stared at me while I looked through the womens [sale] shoes. I worked equally hard to ignore them. Chap in ALDO was smiley while I browsed womens shoes there, as was the even younger girl assistant. Due to a faulty till, and a tagged pair of shoes at Tesco, I twice had to converse with a tall chap in Tesco. The second time to get him to remove the tag. Was very happy to help, and again very smiley. ;-) There would have been no doubt in his mind who the shoes were for. Perhaps attitudes to men wearing heels is more local than we think? More to do with [positive] previous exposure to it, by the individuals involved? Edit to add picture link and remark on material used on shoes. Barratts in the Harlequin at Watford is the only one where I have had possibly a negative reaction from the sales staff, she seem a bit embarrassed looking for size 9's and was a bit uncomfortable with me trying them on, in the end I got one pair from there on that occasion and wore them out of the shop back to the car park. (Its not far and I think I did it more to gauge her reaction than anything else). 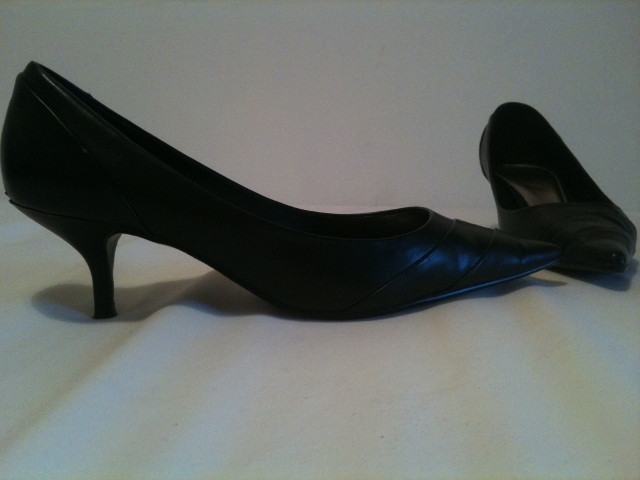 They were a pair of low kitten heel pointy toe courts, cant post a link because they are no longer on the website, but have attached a pic instead. Tesco still only go up to a size 8 and I really need a 9, but I am glad to see that ASDA has started with size 9's, quite a few different types as well, ok so not the greatest manufacturing but cheap enough. I will have to have a size 9 delivered to the store, just not sure about the thinness of the heel, it is pencil thin. I managed to get the size 8's on ok but they were a little tight due to the height but seemed ok for walking in, will have to see if I can get them soon. If you don't already know, Priceless [or what's left of them] are owned by the same people as Barratts. They also do size 9's and can be very inexpensive to purchase from if you catch a particular line going on sale at the right time. Unsurprisingly, larger sizes go first. ;-) They also do postage promotions like the one they have at the moment, a £1-99 delivery charge. I've used the Stores in Wood Green, Reading, and Stevenage. Staff are very helpful, though I've not tried on shoes in the shops as their customer base is typically 14 to 20 year old girls. Not my ideal audience. Walked into a Barratts close to home two days ago. Before I only bought my heeled footwear from internet stores, except from a couple of time I bought in the stores, but never tried them on. A few years back I bought my first pair custom made, so first they measured my feet, then shoelasts had to be made, and when the final product were done, I had to try them on in the store. This is at the Philippines and in the shop there are both men and women working. And ofcourse everybody have to look when a tall, bigfooted, white man is buying high heeled footwear. I would be very surprised, if anyone working at that manufacturer, was shocked at seeing at a man wearing heeled shoes. Might have been a bit impressed at your height, but I doubt anything else would have seen unusual. I hope this purchase is included in the pictures you are hoping to add to the gallery? Philippines is really different so to see a white man ordering high heels is really something special. And each time I`m there, there are many new employees. Anyway, they do a good job to a fairly good price. Nothing beat custom made. 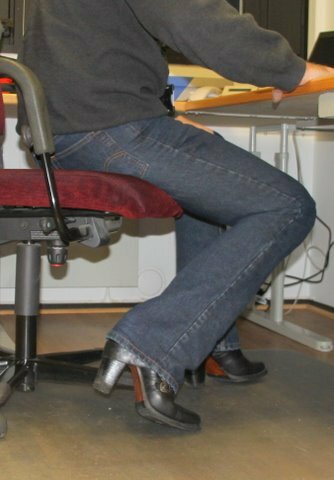 I dont have any pics from the me trying on new boots, but I have pics to ad to the forum. I tried yesterday, but I did not get it to work. Maybe I need more time on the forum before I`m allowed to ad pics? I have pics to ad to the forum. There might be a 5 or 10 post minimum, before adding pictures, but you have already passed that. Below, is the site guide to adding pictures. Hopefully, it's enough to get you loading up pictures. I have no permissions to make albums..still..maybe the number of posts has to be higher..? If creating an album is a problem, I'm sure shyguy can change that. In the even less likely event he can't, he knows a man that can. Even if it transpires there is some restriction, you can add your pictures to these posts? On the bottom right hand side of the edit window, you will see a "More Reply Options" button. It'll open up the 'attachment' option. You can add pictures that way? Checking my galleries revealed one of them was marked Private, for some reason. Even I couldn't see it easily ..... Now made public. My favorite boots, knee height, 5" heels...custom made. Only another 149 images to go?